All of the cold wet weather, living in hostels, crappy sleep, and eating pasta several times a week finally caught up with me. Yesterday I started to feel a little out of it and by the time last night rolled around I could tell I was getting sick. I went to bed really early last night in hopes of fighting the cold but I was tossing and turning all night, plus some of the people in my room started having a conversation at 3:30am again. I got up around 9, ate and then pretty much stayed at the hostel the rest of the day. I ran out a couple times though... one to get some of Germany's Nyquil equivalent, another to get some fresh air by walking around the Alexanderplatz and a third to go get dinner. I cut my second outing short since it was pretty chilly and I figured that wasn't really doing me any good. I was going to meet with Katja and Joerg tonight (friends of Scott and Stephanie) but because I'm feeling like crap and didn't want to get them sick we decided to call it off. Over the course of the day I booked the rest of my lodging in Italy which means I have everything taken care of between now and Paris. The only real thing left is to buy train tickets but all the ones left are simply regional trains that don't need reservations. I was looking at the weather for Italy and it looks like it's going to be much warmer and sunny which is going to be very welcome after two and a half weeks of wet and cold. Tomorrow I get on a train to Prague where I'll spend 3 nights. I've heard great things about the city and I'm really hoping this cold doesn't keep me from seeing and doing everything I want to there. The rain stayed away today so I spent the first half of the day out exploring. 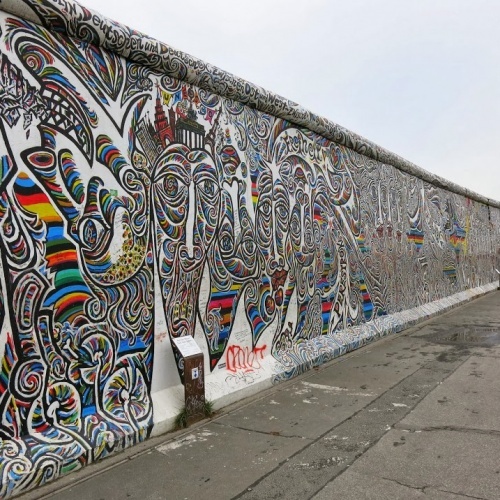 There's a huge section of the Berlin Wall not too far from the hostel called the East Side Gallery. 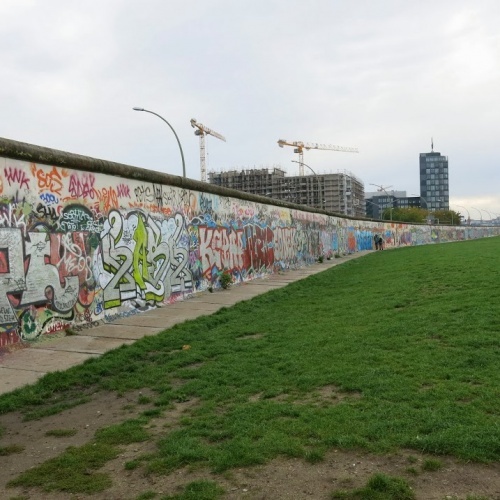 I walked over there and walked along the stretch of wall. Most of the artwork on the wall was done in 2009 and only some of the stuff was original. 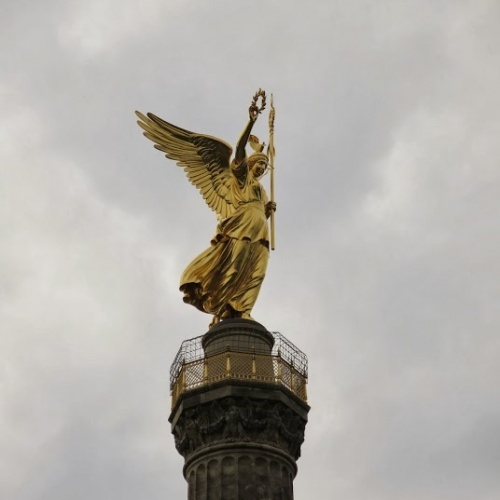 From there, I jumped on the S-Bahn and went to Alexanderplatz where I walked the Unter der Linden to the Brandenburg Gate. The walk is supposed to be a really scenic street but literally the entire road for about a mile was under construction. I'm not sure what the deal was but instead of being a peaceful stroll it was a frustrating mess of construction, people and diversions. 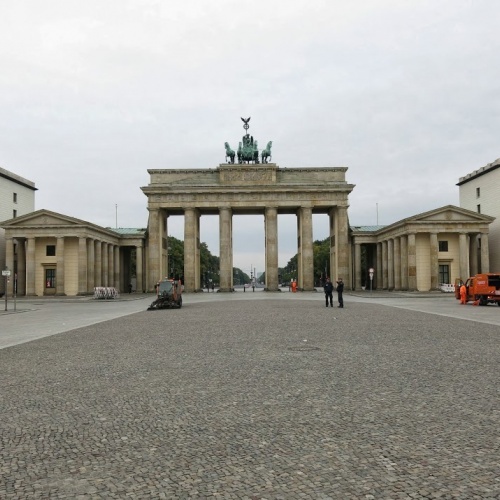 The Brandenburg Gate area was slammed pack full of people taking photos. I'm glad I was able to get some when I first arrived before people showed up. I didn't even bother trying to take any today because it was so crowded. 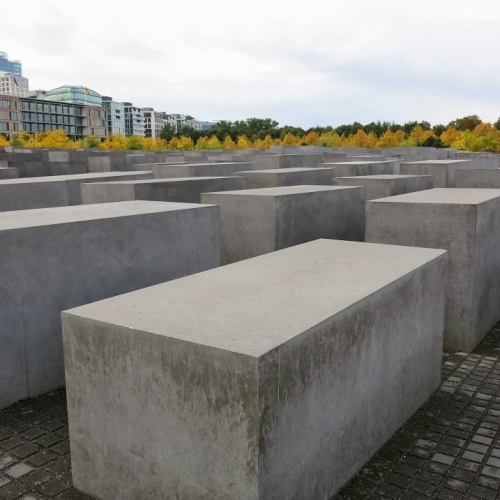 The Holocaust Memorial isn't too far from the Brandenburg Gate so I walked to it. It's a pretty cool grid of various sized rectangle concrete blocks over an uneven floor which makes walking through it pretty neat. 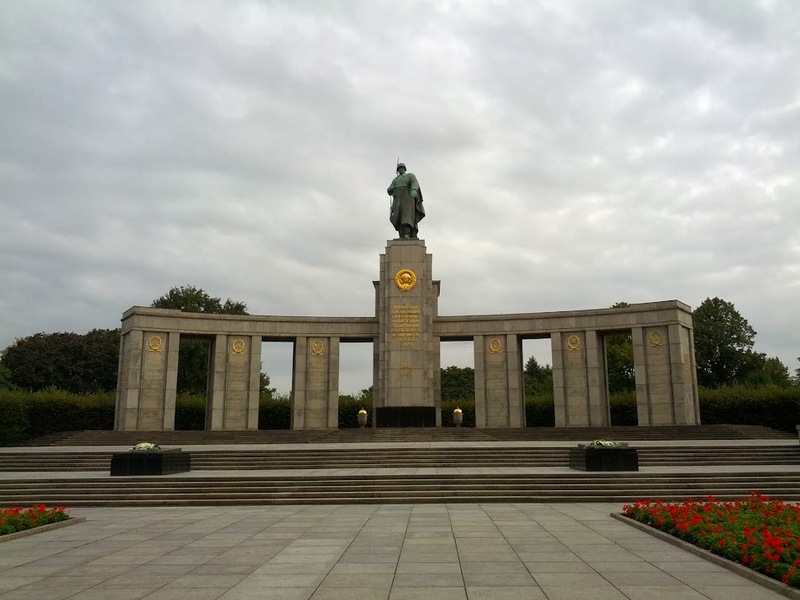 I wanted to go back to the Victory Column but for some reason they had all the routes blocked off. I'm not sure what's getting ready to happen but it I couldn't head over there. 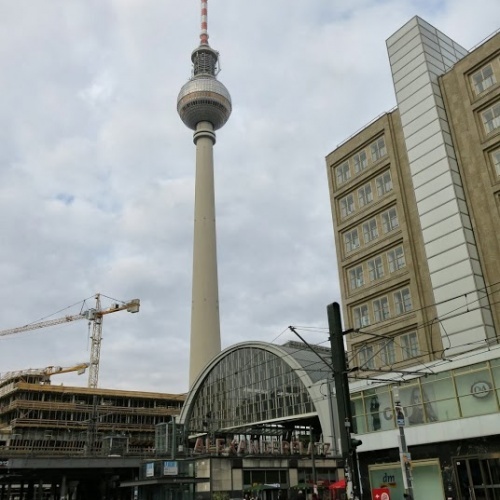 Instead, I walked back to the Berlin Hauptbahnhof and got the connections back to the hostel. Since getting back I've been working more on getting my travel and lodging booked between now and Paris. I was stumped how I was going to get from Vienna to Italy since all of the trains ran at funny times and I wasn't really too pumped about another overnight train experience. Instead, I simply booked an hour long flight from Vienna to Florence, Italy. From Florence I'll get a regional train to Lucca where I'll spend a couple days. Tomorrow I'm going to head to Charlottenburg Palace which is supposed to be modeled after Versailles, including the expansive gardens. Some people in my room came in drunk at 4:45 this morning and proceeded to discuss food, religion, drinking and drug habits for an hour before finally going to bed. Needless to say I was pretty pissed off from being woken up that early and didn't really get good sleep after that. It was raining when I woke up and hasn't stopped all day. I went to the Turkish Market that's pretty close to the hostel and got soaked. It would have been a fun time if it wasn't for the rain. There were tons of food, vegetable, fruit, bread, cloth, and misc vendors set up along a big street. Even in the rain it was still pretty busy. Rather than deal with low 60's and constant rain I came back to the hostel to read and work. If the weather is nice tomorrow I'll head out and do some more exploring. If it's cold and raining again I'll probably just make it another working day. I'm passed the point in my travels where I feel the need to go out and get soaked all for a few photos. I saw the majority of what I wanted to see during the first two days when it was better weather. I slept really well last night after the sleeper train the night before and hiking around with my backpack all day. This morning I got up, had a cup of coffee and then went out to get some food. Since all the markets were closed yesterday I didn't have a chance to pick up any breakfast food. I went to Lidl and got an apple pastry for breakfast, lunch stuff (bread, strawberry preserves and fake Nutella) and some pasta for dinner. Back at the hostel I ate my breakfast and had some more coffee then set off for Checkpoint Charlie. Even though I have an unlimited train card, I wanted to get some fresh air and the walk was pretty nice. 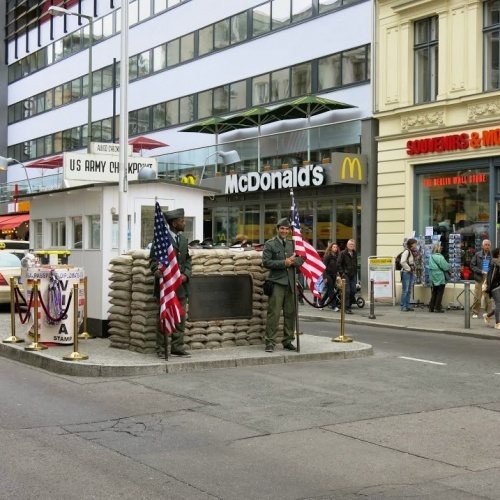 Checkpoint Charlie is in the middle of a busy street surrounded by all kinds of restaurants, shops, street food vendors (Checkpoint Curry anyone?) and souvenir stands. 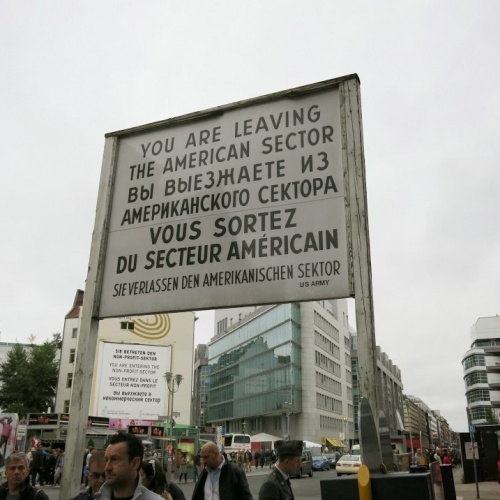 There was also an outdoor museum with a lot of information about Checkpoint Charlie, the wall and the history surrounding it all. From there I headed north and then got diverted over to Museum Island due to road construction. 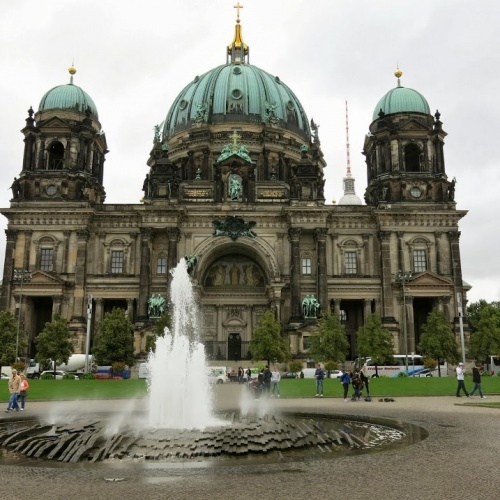 I saw the Berlin Cathedral and walked around some of the museums. I didn't go in any of them due to the entry costs being so high. Maybe later in the week I'll venture into one though. One thing to note... for some reason there are a lot of... for a lack of a better word... gypsies, out around Berlin. I'm not sure what the scam is but I walked around enough today to pick up a sense for something not being right. Basically what happens is a young boy or girl will come up to you asking if you speak english. They have some kind of leaflets in their hand as well. All of this takes place in busy areas and their parents/cohorts aren't usually too far away. I never acknowledged them so I'm not sure how the scam plays out, but I'm assuming they find out you speak English and either try to sell you some kind of leaflet or use it to distract you while someone else conveniently "bumps" into you and makes off with your valuables. I've read about those scams enough online to think that's probably what's going on. Anyway, after museum island I went back to Alexanderplatz where I ate lunch and walked through a huge electronics store called Saturn. I was hoping I could get an actual European plug for my laptop so I didn't have to keep using my adapter. Unfortunately they didn't sell just the cord I needed. I came back to the hostel and worked for several hours before making dinner. I overheard some people at the hostel today talking about how every Tuesday and Friday there's a huge Turkish outdoor market. It's within easy walking distance from my hostel so I'm going to head over there tomorrow and check it out. 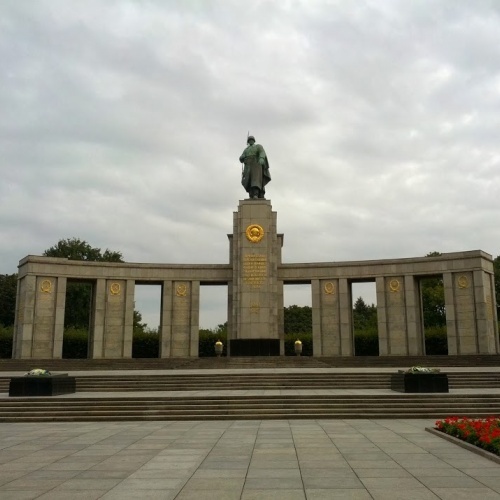 I made it to Berlin! The train ride last night went pretty well. I watched the countryside go by until it got dark, read for a bit and then went to sleep. I got up around 6 to get ready for the arrival into the Berlin HBF. The first thing I did when I got to the train station was buy a 7 day unlimited card for use on the S bahn and U bahn (underground and above ground trains). I had a chai tea latte and a muffin for breakfast then started walking around the area near the train station. 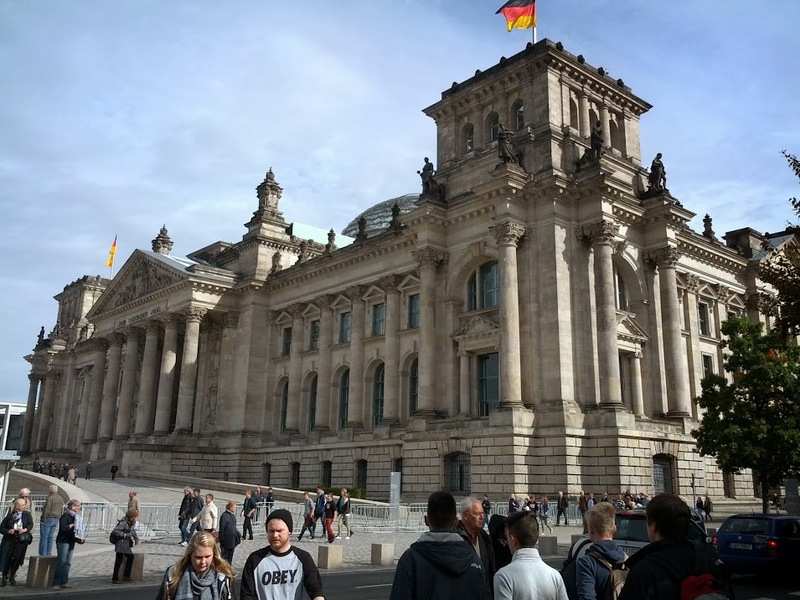 I saw the Reichstag (German Parliament building), the Brandenburg Gate and the Victory Column. All in all it was about 4 miles of walking first thing in the morning. 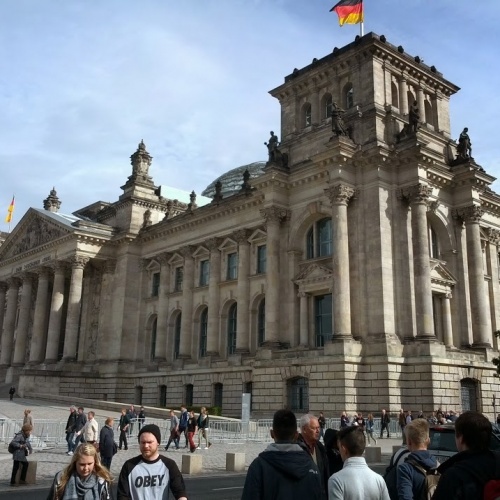 I got on the train to Alexanderplatz and walked around there for a bit. I saw the Berliner Fernsehturm (a giant tower in the middle of town). I ended up having some beer and tried some currywurst. I've been trying to try some of the local food wherever I go and currywurst was recommended for Berlin. It's basically a bratwurst cut up and covered in a curry/ketchup sauce and served with a roll. It was pretty good. I got on the train to the area near my hostel which ended up being a really lively area full of Turkish restaurants, cafes, bars, markets and people everywhere. I eventually found the hostel and got checked in. I walked over to a Lidl to get some food for the next few nights but unfortunately I forgot that most groceries are closed on Sunday. I'm getting pretty hungry but I'm not sure what I'm going to do yet for food. I'll probably have to give one of the turkish places a try since another food that was recommended to try in Berlin is a Doner (basically a Turkish version of the gyro). I'm already feeling tired as well so I don't think tonight will be a late one. Tomorrow I'll set out to do some more exploring around the city.